Even before the Automatic Safety Transmission went on sale, Thompson’s group was already working to make the semiautomatic transmission obsolete. All that remained was to eliminate the clutch pedal and design a hydraulic control unit smart enough to autonomously manage all shifting in normal driving. Thompson’s solution to the latter problem was outlined in the patent disclosure he filed in April 1938 (U.S. Patent No. 2,204,872). It again described a four-speed transmission using two planetary gearsets and an additional set of spur gears for neutral and reverse. As in the Automatic Safety Transmission, the planetary gearsets’ brake bands and clutches were operated by servos. Oil flow to each servo was controlled by a separate hydraulically operated valve, each of which was now operated by a spring-loaded control piston. Actuating pressure for those pistons was supplied by an engine-driven centrifugal governor whose output (in this iteration of the invention) was proportional to engine speed. However, the earlier designs’ completely mechanical throttle linkage was deleted in favor of a new throttle-controlled hydraulic compensator line that served to vary the amount of hydraulic pressure necessary to operate the control valves. The wider the throttle was opened, the more governor pressure it took to move each piston rod and open the associated shift valve. In this way, each forward gear ratio was ‘mapped’ to a specific range of governor output pressure. Pressure exceeding or falling below that range would trigger an automatic shift up or down, respectively. The final major element — a fluid coupling that could replace the Automatic Safety Transmission’s plate clutch — was outlined in the patent filed in February 1937 (U.S. Patent No. 2,176,138) by Oliver K. (“O.K.”) Kelley, who had worked with Thompson at Cadillac and later joined him in the Transmission Development Group after a stint at GM’s Yellow Coach and Truck subsidiary. Although it was actually patented more than a year before Thompson’s hydraulic controls, it seems more appropriate to discuss Kelley’s design second. While Thompson’s patent was essentially an extrapolation of the group’s previous semiautomatic transmissions, Kelley’s was a substantially new design with some significant variations. Not only did it use a fluid coupling rather than a plate clutch, there were now three planetary gearsets rather than two (although there were still only four forward speeds) and no spur gears; the third gearset was now used to provide reverse reduction. There was also an important new feature: an additional intermediate shaft, concentric with the transmission main shaft, whose leading end was permanently attached to the impeller. 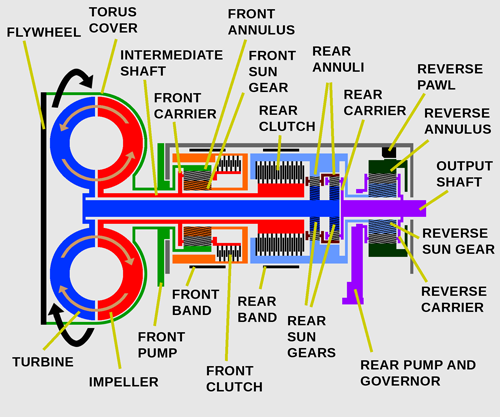 The intermediate shaft, which was driven by the planet carrier of the front planetary gearset, served to connect the impeller to the clutch assembly of the second planetary gearset. * In Neutral, the rear band is applied with the engine off, but released with the engine running. The intermediate shaft served two important functions. First, it provided an indirect connection between the engine and the impeller of the fluid coupling. With most fluid clutches, the impeller is bolted or otherwise attached directly to the engine flywheel — in automotive applications, typically through the coupling’s torus housing. In Kelley’s design, the engine instead drove the annulus (ring gear) of the front planetary gearset. The annulus then drove that gearset’s planet pinions and planet carrier, which in turn drove the immediate shaft and with it the impeller. 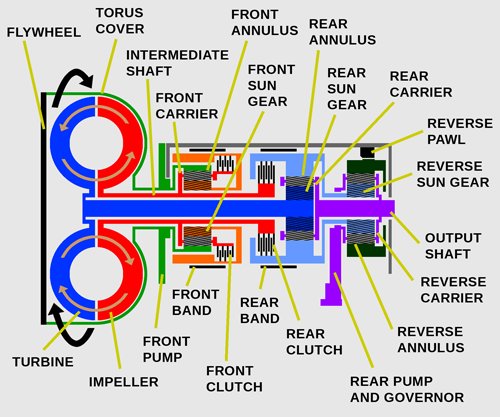 As a result, the impeller and the engine only turned at the same speed if the front clutch were engaged, which locked the front planetary gearset in direct drive (which in this case happened in second or fourth). With the front clutch released and the front brake band engaged (i.e., in first, third, or reverse), the speed of the impeller would be reduced by the ratio of the front gearset. The purpose of this unusual arrangement was to deliberately reduce the efficiency of the coupling at idle and off-idle speeds to provide smoother takeoffs and minimize ‘creep’ in first or reverse without hampering efficiency at higher speeds. Even Kelley recognized that this arrangement was more complicated than it probably needed to be, but the underlying principles were solid and by this time mostly well-understood. If the design was inelegant, it was at least functional and, just as important, production-feasible. Production feasibility was still a major priority for Oldsmobile, which remained actively involved in the development process. Based on the timetable, it appears that as soon as Thompson’s team came up with a viable-seeming idea, it was handed off to Oldsmobile engineers for evaluation and testing; McCuen wanted something that could replace the Automatic Safety Transmission in the near future. By early 1939, Oldsmobile engineer Harold N. Metzel was already overseeing the road-testing of some 5,000 preproduction examples of the new transmission. Inevitably, the transmission underwent further changes before reaching production; some but not all of those changes are described in Kelley’s April 1939 patent disclosure (subsequently U.S. Patent No. 2,211,233). Thompson’s single oil pump, which as originally described was driven both by the engine and the tail shaft, was replaced with separate front and rear pumps, the shaft of the latter also driving the governor assembly. As a result, shift points of the production transmission were once again governed primarily by road speed rather than engine speed. The design and layout of the shift valves and throttle-controlled pressure lines was extensively revised (although the basic principle was still as described above). Finally, Thompson developed a new and significantly more efficient fluid coupling design, patent applications for which were filed in 1940 (U.S. Patents 2,357,295 and 2,430,258). The other major mechanical change was a completely redesigned third (reverse) planetary gearset. In reverse, the second and third units acted together as a single compound gearset. The second-unit annulus was attached to and rotated with the third-unit sun gear while both the second- and third-unit planet carriers were splined to the output shaft. Reverse rotation was provided by releasing both the clutch and the brake band of the second unit. Rotation of the second-unit sun gear, still driven by the fluid coupling turbine through the main shaft, would then cause the second-unit annulus and third-unit sun gear to rotate backward. Engaging a toothed reverse pawl locked the third-unit annulus in place, turning the carriers and thus the output shaft backward in reduction. The reverse pawl also served to lock the driveshaft with the engine off. The resulting transmission still bore a clear resemblance to the Automatic Safety Transmission it would shortly supersede, but it no longer required a clutch pedal or much driver intervention in most normal operation. In High, the transmission would start in first and then shift for itself through all four gears. The previous Low range was retained, allowing the driver to keep the transmission in first and second at speeds up to about 40 mph (64 km/h), but that was usually only necessary for steep hills or perhaps hauling a heavy load at low speeds. GM christened the new transmission Hydra-Matic. Although Oldsmobile would have exclusive use of it for the first year — a corporate policy acknowledging the considerable resources the division had poured into the transmission’s development — GM had big plans for the automatic. A new Detroit Transmission Division, headed by Victor A. Olsen, was established specifically to manufacture Hydra-Matic. William Carnegie, who had been with Thompson’s group since 1933, was appointed chief engineer of the new division, which got its own assembly facilities in a former Fisher Body plant in eastern Detroit. 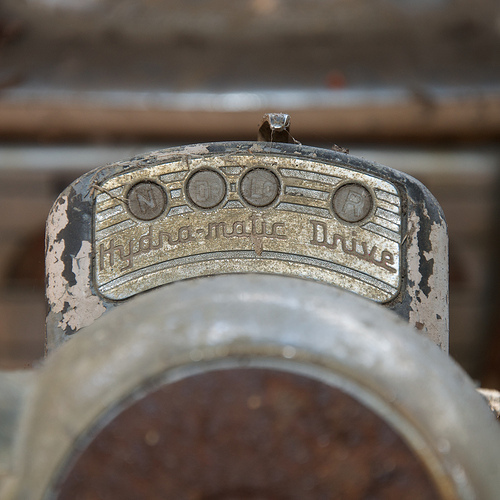 Oldsmobile received the first production Hydra-Matic transmissions (known internally as Model 180) that October. 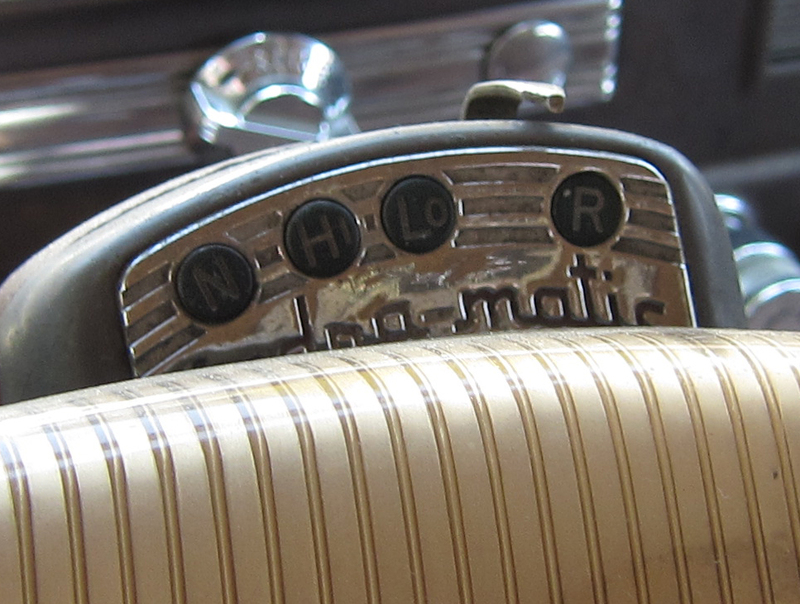 When the 1940 Oldsmobiles debuted late that year, Hydra-Matic was optional across the line at a low introductory price of $57 — actually $19 less than the 1939 price of the Automatic Safety Transmission. As with the semiautomatic transmission, Hydra-Matic included much taller, economy-oriented 3.42 or 3.63 axle ratios (compared to 4.10 or 4.30 for manually shifted cars). Oldsmobile advertising was predictably breathless about Hydra-Matic, extolling its ease of use and reduced fuel and oil consumption. If the latter claims were again optimistic (Oldsmobile started off claiming savings of up to 20%, soon amended to 10–15%), the other boasts were well-earned. Hydra-Matic was a genuinely paradigm-changing innovation that finally made good on the promises its predecessors hadn’t quite fulfilled. That isn’t to say the early Hydra-Matic was flawless. Aside from its cost, it was bulky and quite heavy; we don’t have any precise weight figures for the early units, but they were probably at least 100 lb (45 kg) heavier than a conventional gearbox. Even discounting the inevitable teething problems, Hydra-Matic was also a complicated and fussy device. For it to work as intended, the various brake bands and linkages had to be kept properly adjusted, which required special tools and a certain amount of finesse. Even then, the original Hydra-Matic was never a paragon of smoothness, tending to shift with a distinct thump. However, the more important thing to most potential buyers was that Hydra-Matic worked, offering the painless two-pedal driving for which so many people had been longing. If the automatic transmission’s commendable efficiency didn’t quite match that of a manual gearbox, that seemed like a small price to pay for the permanent banishment of a generally hated chore. Hydra-Matic also made driving accessible to a whole range of disabled people for whom manual shifting was difficult or impossible. After the war, Oldsmobile would capitalize on that potential by offering “Valiant” models equipped with Hydra-Matic and special driver controls, intended for use by disabled veterans. The upshot of all this was that Oldsmobile sold about 60,000 Hydra-Matic transmissions for 1940, substantially better than the Automatic Safety Transmission had done in two and a half years. 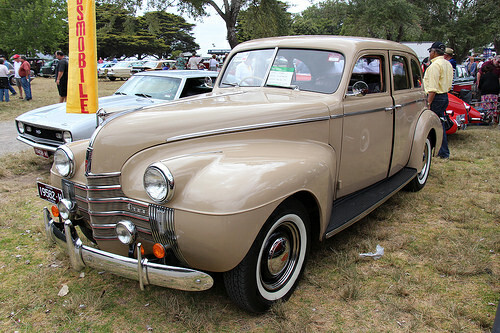 Olds would nearly double those sales for 1941 despite raising the transmission’s price from $57 to a more realistic $100. Oldsmobile’s exclusivity period ended with the 1940 model year, so for 1941, the automatic transmission became available to other GM divisions. Buick still wanted nothing to do with Hydra-Matic, which Buick chief engineer Charles A. Chayne nicknamed “Hydra-Jerk,” nor did conservative Pontiac chief engineer Benjamin H. Anibal, but Cadillac adopted a new heavier-duty Model 250 Hydra-Matic. The Model 250, most of the particulars of which are described in Kelley’s December 1941 patent disclosure (U.S. Patent No. 2,377,696), functioned much like the Oldsmobile unit, but had greater torque capacity and different first and second gear ratios, courtesy of a new second planetary unit with compounded gears (two distinct but interconnected planetary gear trains) like those of the Automatic Safety Transmission. The second gearset’s rearmost planet carrier handled the job of reintegrating the torque split in third and fourth gears. About 30% of Cadillac buyers ordered the automatic transmission despite its $125 price tag — almost 10% of the list price of a Series 61 club coupe, the division’s cheapest and most popular 1941 model. The option continued for the 1942 model year, which was cut short by the War Production Board in February 1942 so that manufacturing resources could be redirected to the production of war matériel. By then, the Detroit Transmission Division had delivered almost 215,000 Hydra-Matic transmissions. Unlike Oldsmobile and Cadillac passenger cars, Hydra-Matic would not cease production during the war. Instead, the automatic transmission would find a whole new application. When America entered the war in late 1941, the principal U.S. light tank was the M3 Stuart, manufactured by the American Car & Foundry Co. In its initial production form, the M3 weighed 14 tons (12.7 metric tons) and was armed with a 37mm cannon and four 0.30-caliber (7.62mm) machine guns. It was powered by a seven-cylinder Continental W-670 radial engine with 262 gross horsepower (195 kW), providing a reasonably sprightly top speed of 36 mph (58 km/h). 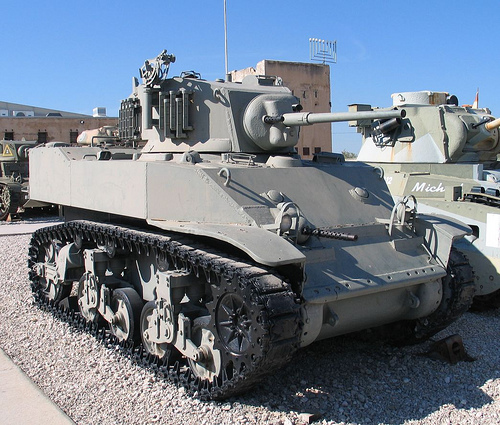 Even before the U.S. declaration of war, the M3 was already seeing active duty with the British Army, which nicknamed the tank “Honey” and made extensive use of it in North Africa. By 1942, the M3 would also be in widespread service with the U.S. Army and the United States Marine Corps. With demand for the Continental radial engine already outpacing supply by mid-1941, some M3s were built with the less-powerful nine-cylinder Guiberson diesel. As an alternative, Cadillac proposed a new M3 variant that would trade the nine-cylinder radial engine for two of the division’s passenger car V-8s. 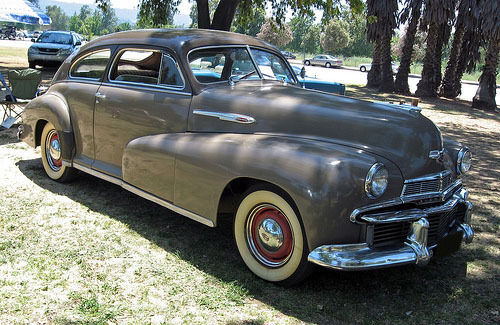 That project, supervised by Cadillac engineer Edward N. Cole (later to become chief engineer of Cadillac and Chevrolet and eventually president of General Motors), used two more-or-less stock 346 cu. in. (5,676 cc) Cadillac L-head V-8 engines, each rated at 148 gross horsepower (110 kW) and each driving one tread via a beefed-up Hydra-Matic transmission. The twin Cadillac engines gave the redesigned tank the same top speed as the M3A1 despite a weight increase of about 5,100 lb (2,313 kg). The Hydra-Matic transmissions not only reduced driver workload (an important consideration in a combat vehicle — particularly tanks, which as a rule are cramped, deafeningly loud, and have dreadful visibility), but also allowed the installation of full dual controls so that the tank could be operated by either the driver or co-driver as needed. The Army Ordnance Department was duly impressed, so the first production example of the redesigned tank, designated M5 Stuart (Stuart VI in British service), rolled off the Cadillac assembly lines in March 1942. In June, Cadillac created the M8 Howitzer Motor Carriage, which shared the M5’s chassis and powertrain, but had a different turret carrying a 75mm artillery piece. About 1,800 M8s and almost 9,000 M5s and improved M5A1s were built in all, some by Cadillac and some by the tractor manufacturer Massey-Harris. Although the M5 was fast for a light tank, it soon became painfully apparent that it was too lightly armed for the European theater. Cadillac responded with an enlarged version that retained the dual-engine powertrain, but traded one of the 0.30-caliber (7.62mm) machine guns for a 0.50-caliber (12.7mm) gun and the 37mm cannon for a new 75mm cannon shared with the North American B-25H Mitchell bomber. 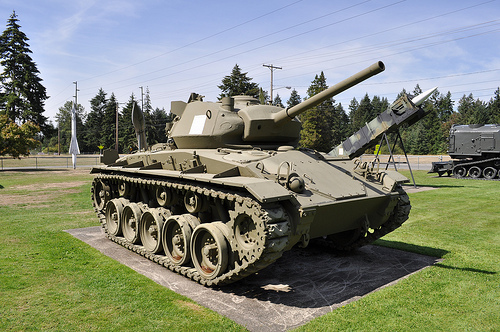 The new tank, dubbed M24 Chaffee, began entering service in April 1944 and reached frontline units that November. More than 4,300 M24s were built by the end of the war and some remained in service until the late eighties. Late in the war, there were also a number of M24 derivatives sharing its chassis, engines, and automatic transmissions, including the M19 anti-aircraft gun carriage and the M37 and M41 self-propelled howitzers. In all, around 25,000 wartime Allied military vehicles used the Hydra-Matic transmission, not including passenger cars. Military duty brought only minor design changes to the civilian Hydra-Matic, but the experience pushed the Detroit Transmission Division to resolve most of the transmission’s early issues and demonstrated that Hydra-Matic was fundamentally sound and reasonably reliable despite its complexity. 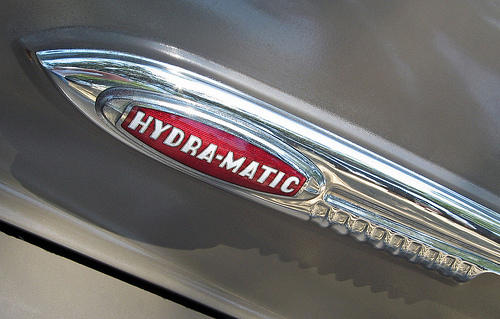 Postwar Cadillac and Oldsmobile advertising would proudly proclaim that Hydra-Matic had been proven in combat. Hydra-Matic really took off during the postwar boom. Buick and Chevrolet still disdained it, eventually opting to develop their own torque converter automatics based on the latest concepts from the corporate engineers, but Pontiac reluctantly adopted Hydra-Matic in 1948. The transmission was enormously popular despite its high prices, which in 1948 ran to $174.25 on a new Cadillac and $185 on an Oldsmobile or a Pontiac (the latter equivalent to more than $1,600 in 2010 dollars). 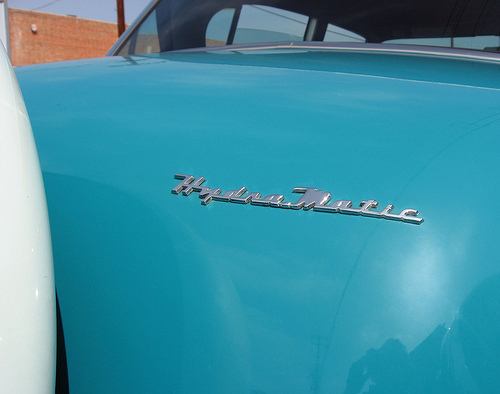 That year, 73% of Pontiac buyers, 97% of Cadillac buyers, and nearly all Oldsmobile buyers opted for Hydra-Matic. The Detroit Transmission Division built its 1 millionth Hydra-Matic in January 1949. By then, it was apparent that not only was automatic transmission a major marketing advantage, lacking an automatic was becoming a serious competitive handicap. Despite the scorn of critics like Mechanix Illustrated‘s Tom McCahill, American buyers were more than happy to accept the drawbacks of automatic transmission if it meant not having to shift. Inevitably, other automakers were soon forced to follow GM’s lead. Ford and Studebaker turned to Borg-Warner to develop three-speed torque converter transmissions while Packard introduced its proprietary Ultramatic in May 1949. With the ever-growing demand for Hydra-Matic, the Detroit Transmission Division needed more production capacity than the original factory in Detroit could accommodate. Later that year, the division relocated to a new and much bigger plant in Livonia, Michigan, allowing GM to further expand production and offer Hydra-Matic to automakers that couldn’t afford to develop their own automatics. Remarkably, one of the first non-GM customers was Lincoln-Mercury, which added Hydra-Matic as a Lincoln option in mid-1949; Ford’s new Fordomatic/Merc-O-Matic wasn’t yet ready and in any case didn’t have the torque capacity for the big Lincoln V-8. Lincoln was followed in short order by Nash, which added Hydra-Matic for the 1950 model year, and then Hudson and Kaiser-Frazer, which introduced Hydra-Matic for 1951. Most outside customers didn’t bother to conceal the Hydra-Matic’s GM origins, happy to take advantage of its reputation and name recognition. This 1954 Nash Ambassador Custom’s badges proudly announce that it carries the optional Hydra-Matic transmission, which Nash purchased from GM. Detroit Transmission Division also developed several grades of extra-heavy-duty Hydra-Matic for commercial chassis and heavier vehicles. GMC Truck & Coach introduced Hydra-Matic for some models in 1949 and later extended the option to GMC trucks up to 1½ tons. (Chevrolet made Hydra-Matic optional for some trucks beginning in 1954.) There would also be various other military users, including the M59 armored personnel carrier and, in the early sixties, the M114 tracked command and reconnaissance carrier. With so many new customers, it took GM less than two years to sell another million Hydra-Matics, making the Hydra-Matic by far the most successful automatic transmission in the world. Along the way, Hydra-Matic’s internal ratios changed several times, as summarized on the following table. Early Cadillac and military Hydra-Matic transmissions used a compound rear planetary gearset, but to our knowledge, all other iterations used a non-compound rear planetary with a ratio of either 2.53 or 2.63:1. * Not all civilian users adopted these ratios; those that did (principally Cadillac and Pontiac) adopted them for the 1955 model year.